Are you tired of not getting all of the info you want out of your weather apps or even off of your local TV news broadcast? Humidity is one of the most important weather tidbits you need to know each day, and yet it’s often left out in popular weather apps. Meanwhile, weather forecasts on the news might not even be accurate for your area, since they’re probably forecasting for the closest major city. 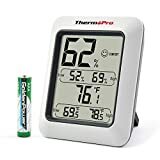 With the ThermoPro TP50 Hygrometer Thermometer and Indoor Humidity Monitor, you’ll get a precise temperature and humidity reading exactly where you stand. Trust us, it’ll be the best $8 you’ve ever spent.